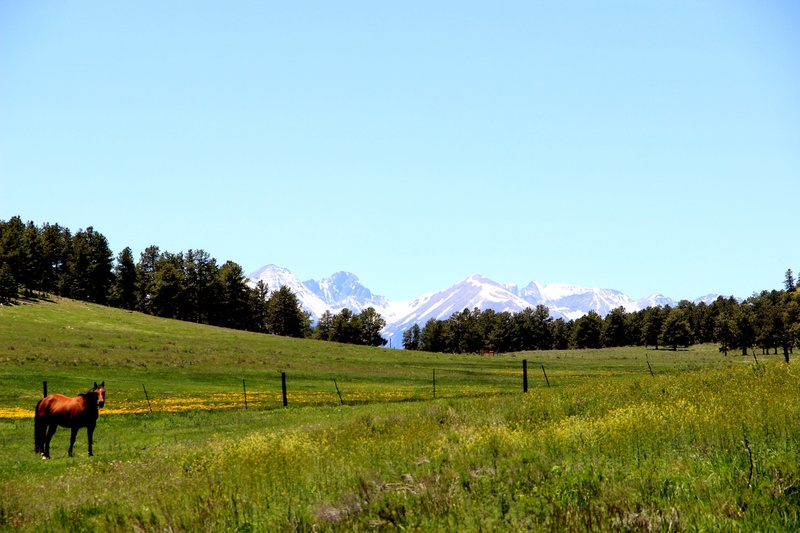 Monday morning we took the 2.5 hour drive from Denver to Westcliffe Colorado. We cut through Colorado Springs, gained a ton of elevation, and saw some great views right from the highway. Once we were within a few miles of the cabin though, the scenery was turned into overdrive. We stopped and took a few pics of some horses with the snow-capped Sangre de Cristo mountain range as the backdrop – stunning! Once settled at the cabin, we headed out to find some mountain fishing which was situated nearby. We set up our spinning rods and threw some panther martin spinners to some eager trout. We both did well, but Athena caught a real gem, honestly a fish of a lifetime, a 21” rainbow trout. We threw them all back except for the big guy, who provided the freshest of fish dinners. After dinner, we headed back to an area of giant boulders located near our fishing hole which we had spied earlier in the day. 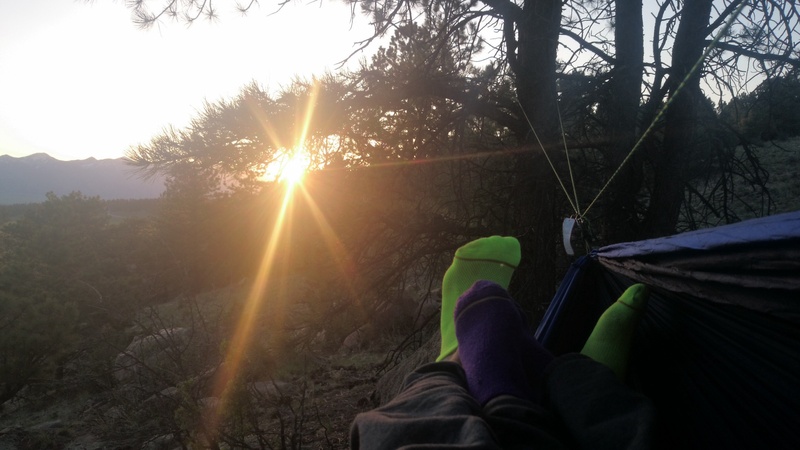 We traded in the fishing gear for a hammock, a tiny speaker and some wine and positioned ourselves to watch the sunset over the mountain range. It was an absolute perfect ending to our first day in CO outside of Denver. The next morning we found a hike that would take us straight into the heart of the peaks to the west of us, an 11+ mile round trip trek to the alpine Comanche Lake. We gained about 2,300 feet of altitude on this challenging journey, and encountered snow on more than one occasion (I normally would “test” these areas for us, ensuring that Athena wouldn’t end up hip/knee deep as I did a few times). There were a number of times where we thought the finish would be just around the next bend, or over the next crux, but the trail and mountain wanted to ensure that we truly earned the beautiful views afforded to us at the end. The lake was an awesome finish, and since we packed our fishing gear, it yielded a couple of wild cutthroat trout to us after some patient casting. In addition to the fish, we saw a few mule deer, some marmots, and what we believe (after checking out a paw print guide in a local bookstore) to be a set of bobcat or lynx footprints in the snow. Immediately after staring down one particular mule deer, Athena from behind me let out a loud gasp. This is it I thought, as i spun around ready to view a heard of elk, a bighorn sheep, mountain lion, black bear, etc. It was instead, a chipmunk. We only had about an hour of rest and sight seeing at the top, as we wanted to allow for plenty of time to get down before dark. The hike down was much quicker, though our knees frequently reminded us of the distance and elevation we had covered thus far. Once we reached the car, we could truly relax. Sitting on cushioned seats was an oasis. The hike had provided a great challenge, but we had conquered it up and down. The pictures below of course don’t do the vastness of the landscape a shred of justice, but they do showcase some of the natural beauty of the area. It was a wonderful hike that we will never forget!